Attain a comprehensive perspective of the medical and legal principles, considerations and controversies surrounding the Guides Fifth with this much-anticipated companion publication. 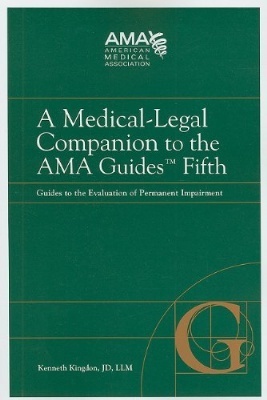 A Medical-Legal Companion to the AMA Guides™ Fifth defines the practice of impairment assessment and is intended to set straight the abuses of interpretation. Authored and reviewed by physician and attorney experts, this companion approaches complex issues in a user-friendly way. Simplified and defined medical measurement techniques and concepts, and legal terminology and principles make this publication relevant to physician Guides users, as well as attorneys, judges and claims professionals.